The Coalition Avenir Québec government is planning to throw out a backlog of 18,000 applications from skilled workers who want to come to Quebec and make a host of other changes to the province's immigration laws, emphasizing French language skills and regional labour needs. In tabling Bill 9 Thursday, Immigration Minister Simon Jolin-Barrette said the goal of the proposed legislation is to make a more "personalized" policy that addresses the worker shortage. At one point, he described the province's new approach as the "Tinder of immigration," a reference to the popular dating app. "We want to give the chance for anybody from anywhere around the world to come to Quebec, but what we say is: come work in Quebec, but you will have to learn French and have the knowledge of Quebec values to be there forever," Jolin-Barrette said at a news conference. The bill tabled this morning includes an amendment to the Quebec Immigration Act to "clarify" its goals, including ensuring immigrants learn French and integrate the "democratic values and the Quebec values expressed by the Charter of Human Rights and Freedoms." It also gives the immigration minister the power to "impose conditions" on new immigrants to ensure they are meeting, among other things, labour demands in the regions, as well as the province's "linguistic, social or economic integration." The bill doesn't, however, offer specifics on how that would be done. Under the bill, titled, "An Act to increase Quebec's socio-economic prosperity and adequately meet labour market needs through successful immigrant integration," any application prior to Aug. 2, 2018 will be made void. The 18,000 applicants still waiting for an answer — some of whom applied as long ago as 2005 — will have the total cost of the application reimbursed, at a total cost of roughly $19 million, Jolin-Barrette said. 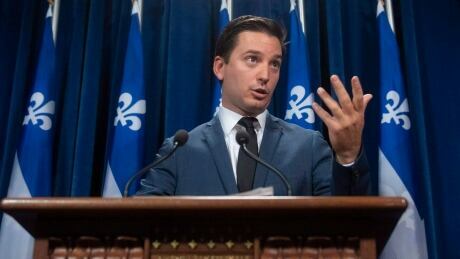 Liberal immigration critic Dominique Anglade said the cancellation of thousands of skilled worker applications would hurt Quebec's image on the international stage. "The message from the government is extremely negative," she said. The CAQ's pledges to cut back on the number of immigrants and to introduce a values test for new arrivals were a centrepiece of last fall's election campaign. The government already tabled a plan last fall to reduce the number of immigrants Quebec accepts this year to 40,000, down from more than 50,000 last year. whether a values test would be legal under Canadian law, and the immigration cuts have raised concerns from businesses that are already dealing with a labour shortage. Quebec's unemployment rate reached a historic low of 6.1 per cent last year.